16 Lavalas members and supporters who were arrested in relation to the killings and other crimes that occurred between 9 and 11 February 2004 in St. Marc’s neighbourhood of La Scierie, 100km North of Haiti’s capital, Port-au-Prince. Amnesty International believes that the delay in bringing Ronald Dauphin to trial is unjustifiable and ispolitically motivated. The organization opposes Ronald Dauphin’s continued detention without trial, which is in violation of his rights and urges the Haitian authorities to release him pending trial. Amnesty International also calls on the Haitian authorities to conduct a thorough and impartial investigation into the 2004 events in La Scierie and bring to justice all those responsible for the killings and other crimes committed by both groups involved in the confrontation, in trials that adhere to international standards of due process and fairness. Impunity for these crimes must not prevail but justice is not served by depriving Ronald Dauphin of his rights. The investigation into the events in La Scierie and thelegal proceedings that prevent Ronald Dauphin’s release pending trial were marred with irregularities and no effort has been made by the Haitian judicial authorities to rectify the situation. As a result, the Haitian state not only has denied Ronald Dauphin his right to a fair and prompt trial but has also denied the victims and their family members the right to justice, truth and redress. arrest warrant against him issued by a competent Haitian judicial authority and the Resistance Front had no legal powers of arrest. The Resistance Front transferred Ronald Dauphin to the custody of the Haitian National Police which kept him at Delmas 33 police station before he was transferred to the National Penitentiary in Port-au-Prince. A St. Marc magistrate in charge of the investigation issued an arrest warrant against Ronald Dauphin and 27 other people on 25 March 2004, three weeks after his detention. The warrant sought the arrest of Lavalas Party supporters allegedly involved in the confrontation and included former Prime Minister Yvon Neptune who was later indicted as an “accomplice” in the La Scierie case. alleged crimes committed by the group supporting former president Jean-Bertrand Aristide and failed to identify the victims among the former president supporters and their alleged perpetrators. Furthermore, the magistrate referred the co-accused to stand trial without a jury, contrary to the provisions of Haiti’s Penal Code. All crimes of blood have to be brought to trial with a jury. Ronald Dauphin and his co-accused appealed against the indictment. 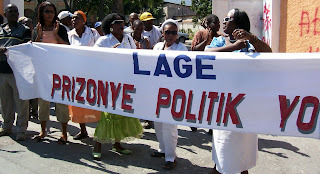 On 13 April 2007, the Court of Appeal in Gonaïves (75km to the North of St. Marc) issued a decision criticizing “grave procedural errors,” and “deplorable thoughtlessness” in the pre-trial investigation and requesting a new investigation. It also ordered the cases of Ronald Dauphin and several others to be sent back to the St. Marc First Instance Court “to repair the above-mentioned omissions and abuses of power” and dismissed the charges against some of the co-accused Amnesty International August 2009 AI Index: AMR 36/003/2009 prompting their release from prison. More than two years later, no advances have been made in the case. temporary”. In May 2009, private doctors examined again Ronald Dauphin and called on the authorities to immediately transfer Ronald Dauphin to a hospital where he could receive appropriate medical care. While all of the other co-defendants have now been released (one died in prison from untreated tuberculosis), Ronald Dauphin remains imprisoned as a result of the vagaries of the Haitian judicial system. Human Rights' Independent Expert on Haiti, Louis Joinet (2002-2008) dismissed allegations that there had been a “massacre” at La Scierie, but instead a clash between two armed groups which resulted in casualties on both sides. No one has ever been convicted, or even tried in connection with the La Scierie killings. The case of former Primer Minister Yvon Neptune, as a co-accused in the La Scierie case was brought before the Inter-American Court of Human Rights which ruled that the Haitian state violated, among others, Mr. Neptune’s rights to be heard promptly by a competent court, his right to liberty and personal integrity. Mr. Neptune spent two years in prison without trial and was released on 27 July 2006 on humanitarian grounds. and other human rights abuses and bring those responsible on both sides to justice.